The Sierra Madre Tattler! 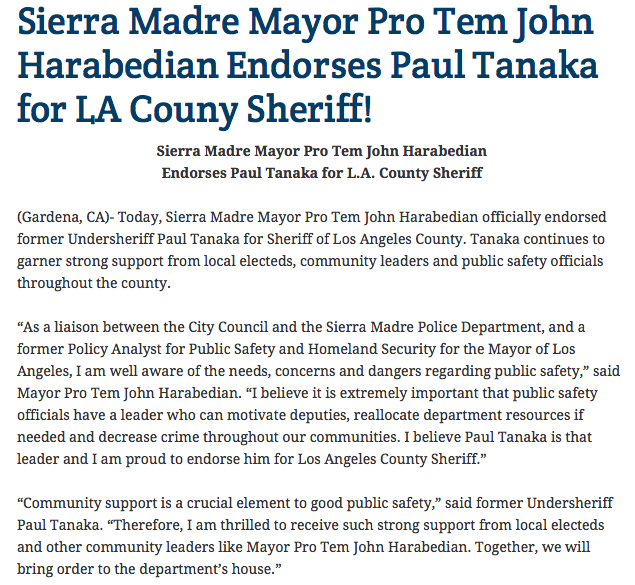 : Sierra Madre Mayor John Harabedian Endorses Paul Tanaka For L.A. County Sheriff? But Why? I thought John was against the Sheriffs. "I endorsed Tanaka BEFORE he was indicted!" Poor Johnny. Tanaka is a Republican! Ed must have led Johnny astray. Before Paul Tanaka declared his candidacy for Los Angeles County sheriff in August 2013, he took three months off work and, once retired from the Sheriff’s Department, the county government cut him a one-time check for $339,424. The payout covered unused holiday, vacation, sick time and other leave he accrued during his 31-year career — all paid at his final salary, when he was second in command. Including his seven months of wages and benefits, the county paid $591,000 for Tanaka in 2013, according to payroll records provided to the Bay Area News Group, part of the Daily News’ parent company. This made him the second-highest compensated employee, next to the chief neurosurgeon at the largest county-administered hospital. You mean, your taxes at rest. Your taxes asleep on the couch and snoring. To give him his due, mr. Harabedian did not come out, like most politicians, and make some stupid remark about how he felt duped by tanaka. Nor did he continue to give his endorsement, at least so it seems. I do t like what I hear tanaka has done, but I also know we live in troubled times. This indictment of tanaka does not make him guilty. yet. I have little trust in the FBI these days. They hold no more trust than the Attorney General. When did he take back his endorsement? I think it is that "troubled times" argument that many use to justfy the exponentially greater amount of American citrizens killed by police here than in other indistrial nations.Maybe the right to kill without consequence is another police entitlement. Like 6 figure pensions. Japan is a civil nation. We are not! No wonder they have so few killings. I agree that Japan is civil, now. But don't expect any of the people who lived through the Nanking massacre to agree with you. Also compare the suicide rates in Japan with an area of equal size in the US. Still violent - different targets. Japan is civil the same way the Civility Party in town is civil. 12:07, check out an event in American history known as Pearl Harbor. I meant to say I don't like tanaka a. By troubled times I meant the government spying on citizens, etc. I need to read before I post. Sorry. I'm dismayed that the Mod left 2:36, 2:37, and 2:48 pm's posts. :36 and :37 are questionable, but :2:48 is egregious. Shame on you Anonymous and please Mr. Mod, remove these racist comments. Can you please explain why you think they are racist? My take is that the original commenter was pointing out that the Police in Japan don't kill their citizens. Unlike here. That makes them better than us. 409 Americans shot dead by their own police. That is an unbelievable number! Why is the mention of Pearl Harbor racist? A lot of police departments are so heavily armed now that they have become more paramilitary than police. There could be some truth to the idea that police are violent people who are attempting to control the violence by being on the right side of the law. But American culture is full of violence. Just consider what is on TV as entertainment. Tanaka is dead in the water. He has all but closed up shop. What a loser. His campaign website hasn't been updated since the primary. Then why are the last two Mayors of Sierra Madre on record as endorsing this guy? Kind of embarrassing. Very embarrassing. And shows us up to be proper fools. Tanaka is asking his staff "who is this guy Harabedian?" If you check out the Tanaka site you'll see that mayors from several cities endorse him. By coincidence they are from cities where Ed Chen is the Chamber of Commerce president. Boy did he lead these people down a primrose path. Great connection. Old Ed using his sale skills. Buchanan did that, Walsh and Harabedian, who else? it's the brat generation - somebody look at me - I'm important!!!! Isn't Chen a garbage company sales dude? Johnny's endorsement carried a lot of weight here in town. McDonnell got 815 votes in Sierra Madre, Tanaka 218. Tanaka also got Nancy Walsh;s endorsement and Susan Henderson's. Real political power there, yessir! Yow. That is 109 votes per Mayor. Noah did better dropping trou. Since this was before the primary, I'll forgive Harabedian that transgression, but I hope he has more sense than to come out now with an endorsement. A lot of people are giving him a pass cause he did the only obvious thing and voted to conserve water? Immedaite? They have some serious spelling issues on the Tanaka website! Maybe Susan Henderson edits it.